Since 1994, Darkrealms has served as an on-line roleplaying community for the Greater Toronto Area and is one of the worlds largest Renegade BBS’s still remaining. LORD, TradeWars 2002, Usurper, and more. Full Fidonet backbone and thousands of Usenet groups on-line, as well as Internet Email. A recreation of the BBS I ran in the early 90’s at 708-460-2847 based out of Orland Park, Il. Running a Real DOS version of Renegade BBS, so door games DO work. Hopefully adding some FIDOnet and maybe Usenet newsgroups. Stay tuned for a TBA Dialup # with Easter eggs to be had! Internal Affairs is dedicated to online door games such as LORD, Planets, TradeWars + more. We are always running LORD tournaments and looking for users to come play. 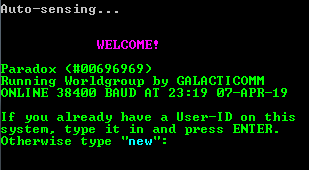 IA BBS also has active message areas and multi-node chat! We’ve got a lot of active users. Come join us! Everyone is welcome.